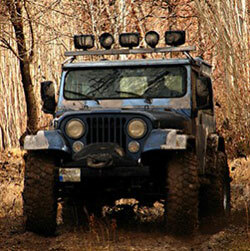 Santa Rosa Transmission and Car Care is the go-to shop for your Jeep service and repair. From routine oil and fluid changes to factory suggested preventative maintenance, Santa Rosa Transmission and Car Care is the Jeep experts. Our maintenance bays are filled with state of the art tools, and our ASE certified technicians have been specially trained to repair Jeeps of every make and model. With over 70 years of combined experience, our technicians can spot your problem and make the necessary repairs quickly, getting you back on the road as soon as possible. Whether you've got a rattle and hum, jerky steering, or trouble starting, we can diagnose and make recommendations for services. We use only the best quality parts for your Jeep service and repair, with our ultimate goal to provide valuable service at the reasonable prices. The best cure for a broken car is prevention – at Santa Rosa Transmission and Car Care, we follow the Jeep factory guidelines for routine services, tune-ups, and inspections. If there's a potential problem, we'll spot it before you're left in a bind. You know you'll travel safely when your Jeep repair is in our expert hands. Our team at Santa Rosa Transmission and Car Care truly live for Car Care. We treat your vehicle as if it were our own, with integrity and thoroughness. We believe in lifelong learning – as new techniques and equipment are developed, we're right there at the front, learning better ways to help you care for your Jeep as well as exploring new and better tools to get the job done. You have choices when it comes to the repair and service of your Jeep. Choose Santa Rosa's most trusted Jeep mechanics– Santa Rosa Transmission and Car Care for all your Jeep maintenance needs. Give us a call or visit us online today!